iTunes could not connect to the iPhone "..." because it is locked with a passcode. You must enter your passcode on the iPhone before it can be used with iTunes. I plug in various devices all the time, just so I can charge them. I do not want them connected to iTunes, I definitely don't want iTunes storing a copy of the device's passcode (or however that works) on my mac, and some of the devices plugged in aren't even mine. How can I stop this from happening? It doesn't happen when I'm booted into 10.7 on the same mac, with the same iOS devices. I already have "Prevent iPods, iPhones, and iPads from syncing automatically" enabled in Preferences. EDIT: this particular device also has "Open iTunes when this device is connected" turned off, so it seems to ignore that setting. 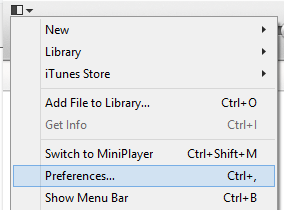 Under Settings → Users → [you] → Login Items → select iTunesHelper, then click the minus sign and log out/into your Mac. No devices will cause iTunes to launch (that's the whole purpose of iTunesHelper). In iTunes there is an option to prevent the app to launch when a device is connected to your computer. Open iTunes > Clic on a device in the sidebar > Scroll down to the "Options" section. If the problem still occurs after that, come back here ! Open iTunes -> Preferences -> Devices. 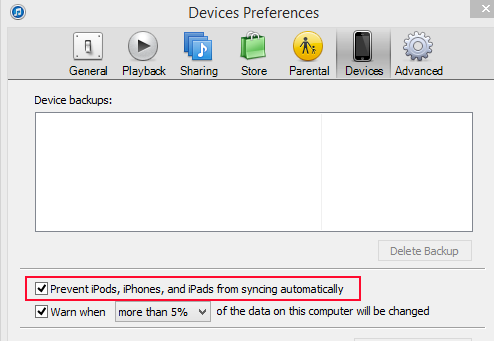 Make sure Prevent iPods, iPhones, and iPads from syncing automatically option is checked. The solution I found that worked since nothing else did for me was to rename the iTuneshelper.exe file before I plug in my iPhone. I use Explorer to get photos off my phone and this is the only way I could do that after I installed iTunes. Apple needs to really work on improving iTunes. I don't find it user friendly at all. Not the answer you're looking for? Browse other questions tagged iphone itunes ipad data-synchronization macos . How do I prevent iTunes from syncing down Voice Memos from my iPhone? Can I permanently disallow OS upgrades on an iOS device?